Bovine leukemia virus (BLV), one of the most common infectious viruses of cattle, is endemic in many herds. Approximately 30–40% of adult cows in the United States are infected by this oncogenic C-type retrovirus and 1–5% of animals will eventually develop a malignant lymphoma. BLV, like the human and simian T cell leukemia viruses, is a deltaretrovirus but, in contrast with the latter, the BLV receptor remains unidentified. In this study, we demonstrate that the amino-terminal 182 residues of the BLV envelope glycoprotein surface unit encompasses the receptor-binding domain. A bona fide interaction of this receptor-binding domain with the BLV receptor was demonstrated by specific interference with BLV, but not human T cell leukemia virus, envelope glycoprotein-mediated binding. We generated a rabbit Ig Fc-tagged BLV receptor-binding domain construct and ascertained that the ligand binds the BLV receptor on target cells from multiple species. Using this tool, we determined that the BLV-binding receptor is expressed on differentiating pro/pre-B cells in mouse bone marrow. However, the receptor was not detected on mature/quiescent B cells but was induced upon B cell activation. Activation of human B and T lymphocytes also induced surface BLV-binding receptor expression and required de novo protein synthesis. Receptor levels were down-regulated as activated lymphocytes returned to quiescence. In the human thymus, BLV-binding receptor expression was specifically detected on thymocytes responding to the IL-7 cytokine. Thus, expression of the BLV-binding receptor is a marker of enhanced metabolic activity in B cells, T cells, and thymocytes. The bovine leukemia virus (BLV)4 is an oncogenic C-type retrovirus and is one of the most common infectious viruses of cattle, with a prevalence that is very heterogeneous worldwide. In some areas, the approximate infection rate in adult cows can reach 30–40%, as assessed by the presence of serum Abs. Approximately 30% of BLV-infected cattle develop a benign persistent lymphocytosis following infection, characterized by a polyclonal expansion of B cells generally expressing IgM and CD5 molecules at the cell surface (1, 2, 3, 4). Under these conditions, the level of lymphocytosis is generally in the range of 20,000–80,000 lymphocytes/μl. After a prolonged incubation period, ∼1–5% of infected cows will develop lymph node (LN) tumors. This malignant lymphoma, classified as “enzootic” or “endemic” bovine leukemia, is generally not detected before 6 years of age. Although cattle are the natural hosts of BLV, the virus can also induce B leukemia/lymphoma in sheep and goats following experimental transmission (reviewed in Refs. 4 and 5). The consequence is invariably fatal with lymphomatous involvement of multiple organs and death occurs within 3–6 mo of detection of leukemia or lymphoma. If the bone marrow (BM) becomes lymphomatous, animals present with leukemias characterized by peripheral lymphocyte counts reaching 100,000/μl. The mechanisms via which the deregulated B cell homeostasis in infected animals evolves into a leukemia/lymphoma are not well understood. In experimentally infected sheep, deregulated B cell homeostasis results from an increased proliferation in the lymphatic system and increased cell death in the peripheral blood (6, 7, 8, 9). Notably, other hematopoietic as well as nonhematopoietic cells can also be infected by BLV, including monocyte/macrophages, T-lineage cells, and endothelial cells (1, 10, 11, 12, 13, 14), but it is not clear whether they have a role in BLV-mediated pathogenesis since B cells have been shown to be the only targets of BLV infection in the peripheral blood (15). BLV belongs to the deltaretrovirus genus that includes only a few other identified species: the human retroviruses human T cell leukemia virus (HTLV) types 1–4 and their known simian counterparts, simian T cell leukemia virus types 1–3. BLV and HTLV-1 are ∼50% similar at the nucleotide level and share many common features in their molecular organization and disease pathogenesis. Accordingly, the gag and pol genes of HTLV-1 and BLV show strong homologies, indicative of their close evolutionary relationship (16). Deltaretroviruses, including BLV, share the same modular envelope organization as gammaretroviruses, even in the variable regions of the protein surface unit (SU) (17, 18, 19), oligomerizing as a trimer (20, 21, 22). Although the SU has been hypothesized to harbor the putative receptor-binding domain (RBD) (18, 23, 24), it is significant that the cellular receptor for BLV has yet to be identified. One reported candidate (25) was later shown to correspond to the ∂ subunit of the adaptor-protein complex AP3, involved in intracellular transport rather than cell surface binding (26). Notably, the unidentified receptor appears to be expressed in many tissues and across many species (27). We previously determined that the 183- and 178-amino-terminal residues of the HTLV-1 and -2 envelope glycoprotein (Env), respectively, are sufficient to efficiently bind target cells of different species (17, 19). This region of the SU, immediately upstream of the so-called proline-rich region (PRR), confers HTLV tropism to heterologous envelopes. Using a soluble-tagged construct encompassing this region (HRBD), we were able to track HTLV receptor expression in lymphocyte subsets (28) and identified Glut1, the ubiquitous vertebrate glucose as a receptor for HTLV-1 and -2 Env (19, 29, 30, 31). It is of particular interest that Glut1, a deltaretrovirus receptor, like all other identified gammaretrovirus receptors, is a multimembrane-spanning nutrient transporter (19, 24, 32). Given the notable motif conservations and similar modular organizations of BLV and HTLV Env (Fig. 1⇓), we hypothesized that the BLV Env region homologous to the amino-terminal 180 residues of HTLV Env would allow a bona fide interaction with the BLV receptor at the surface of target cells. In this study, we demonstrate that this fragment of the BLV SU encompasses the RBD. Interference assays demonstrated that an immunoadhesin, wherein this SU domain was fused to a rabbit Ig Fc (rFc) tag, was able to bind the BLV-binding receptor. Notably, the BLV RBD does not interact with the Glut1 HTLV receptor, demonstrating that these two closely related retroviruses use different cell receptors for entry, as suggested in an earlier study (33). Using our BLV RBD immunoadhesin, we were able, for the first time, to monitor the BLV-binding receptor on various cell types of different species. Moreover, we tracked binding receptor expression on primary hematopoietic cells and determined that expression of the BLV-binding receptor, undetectable on quiescent lymphocytes, is induced upon activation of B cells, T cells as well as thymocytes. Thus, in a manner analogous to the HTLV receptor, surface expression of the BLV-binding receptor on lymphocytes is up-regulated under conditions of enhanced metabolic activity. Schematic representation of tagged BLV-truncated RBD. Schematic representation of the BLV envelope glycoprotein. The signal peptide (SP) and the extracellular (SU) and transmembrane (TM) components of BLV Env are represented as a modular organization based on that of HTLV Env (17 ). The amino-terminal 182 residues of BLV Env, encompassing the cleaved off signal peptide (SP), the putative RBD in SU, with or without the PRR (wavy line), were fused to either a carboxyl-terminal Fc domain of a rabbit IgG (BRBDrFc) or eGFP (BRBDeGFP), respectively. The amino-terminal region of the BLV SU encoding 182 aa, comprising the 33-aa acid signal peptide, fused to a rFc at its carboxyl-terminal was cloned into the pCSI expression vector. This vector contains a CMV promoter, followed by a SV40 intron upstream of the Env gene, and a SV40 poly(A) (34), and is referred to hereafter as pCSI.BLV.RBDrFc, with the soluble protein referred to as BRBDrFc. A second BLV SU construct encoding the 212-amino-terminal amino acids includes the PRR and was generated with a carboxyl-terminal enhanced GFP (eGFP) tag. This construct is referred to as pCSI.BLV.PRReGFP, with the soluble protein noted as BRBDeGFP. The BLV Env expression vector was derived from the pKCR3 vector (Invitrogen) in which the full length Env gene (BLV strain LB59) was introduced. This construct has an SV40 early promoter and the rabbit β-globin intron and poly(A). Cloning details are available upon request. Recombinant proteins harboring the BLV RBD fused to rFc (BRBDrFc) or eGFP (BRBDeGFP) were produced by transfecting 293T cells with the appropriate constructs or with the empty control vector using the calcium phosphate method. After transfection, cells were washed twice with PBS and fresh DMEM was added. Medium containing the various soluble RBD was harvested 48–72 h after transfection, filtered through a 0.45-μm filter, and frozen at −20°C until further use. Fusion proteins harboring the HTLV-2 RBD, HRBDrFc and HRBDeGFP, were similarly produced, as previously described (17, 19). Quantification of a BRBDrFc preparation, as assessed by ELISA (Zeptometrix), revealed levels of >100 ng/ml. Binding assays were performed using saturating levels of RBD constructs. The JY EBV-transformed human B cell line, the Jurkat human T leukemic cell line, and the BL3 bovine lymphoblastoid cell line were grown in RPMI 1640 supplemented with 10% FCS. All other cell lines were grown in complete DMEM, including 293T human embryonic kidney cells, TE671 human medulloblastoma cells, HeLa human cervical carcinoma cells, NIH3T3 mouse fibroblast cells, COS-7 African green monkey kidney cells, PK15 porcine kidney cells, D17 canine osteosarcoma cells, A23 hamster fibroblast cells, CCL64 mink lung fibroblast cells, Mus dunni mouse tail fibroblast cells, TEK bovine embryonic thymus cells, KNS-R bovine nose mucosa cells, PO sheep kidney cells as well as the corresponding BLV-infected cell line, PO/BLV, and the BLV-infected fetal lamb kidney cell line FLK/BLV. TEK, KNS-R, PO, and PO/BLV cells were provided by R. Riebe (Collection of Cell Lines in Veterinary Medicine, Insel Riems, Germany). BL3 and FLK/BLV were provided by J. C. Twizere and L. Willems (Faculté Universitaire des Sciences Agronomiques de Gembloux, Gembloux, Belgium). The nonadherent Sf9 insect cell line was grown in serum-free Grace’s insect cell culture medium (Invitrogen). Twenty-four hours before their use in binding assays, cells were split and seeded at a confluence of 2 × 106 cells in a 10-cm tissue culture plate. Adult peripheral blood, obtained from healthy adult donors, as well as umbilical cord blood, obtained immediately after delivery of full-term infants, were collected in heparinized tubes. PBMC were separated from RBC upon Ficoll-Hypaque separation. CD4+ T cells were purified by negative selection using tetrameric complexes in which one Ab recognizes a surface Ag on B cells, monocytes, NK cells, and CD8+ cells and the other recognizes glycophorin A on the surface of RBC (RosetteSep; StemSep Technologies). 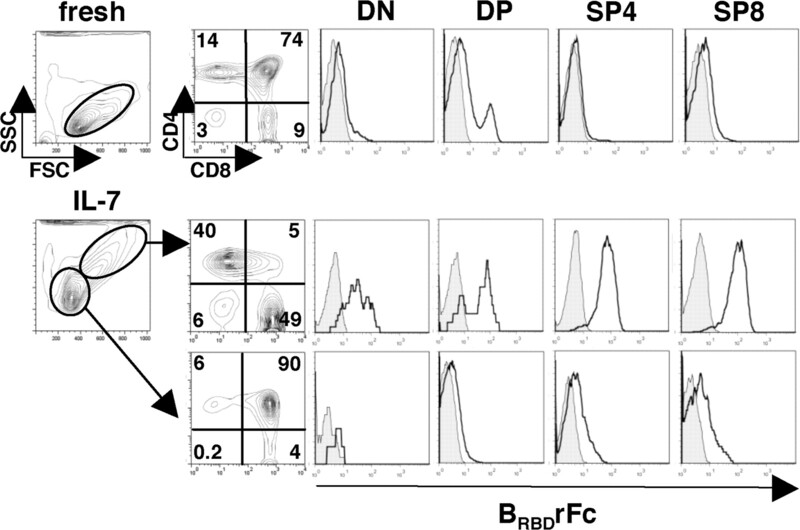 Non-CD4+ T cells were then pelleted upon Ficoll-Hypaque separation. The percentage of contaminating CD4+CD14+ monocytes was <0.5%. B cells were positively selected using a mixture of Abs that recognize the CD19 Ag present on mature and progenitors B cells (Easy Sep; StemSep Technologies). The purity of the selected cells was monitored after each isolation on a FACSCalibur (BD Pharmingen) following staining with either FITC-conjugated anti-CD3 and PE-conjugated anti-CD4 mAbs for T cells or a FITC-conjugated anti-CD19 mAb for B cells (Immunotech). The purity of the selected cells was >90%. Human T and B lymphocytes were cultured in RPMI 1640 medium supplemented with 10% FCS, penicillin, and streptomycin. T cells were stimulated with immobilized anti-CD3 (OKT3) and anti-CD28 (clone 9.3; provided by C. June, University of Pennsylvania, Philadelphia, PA) mAbs (1 μg/ml) with the addition of rIL-2 (100 U/ml) at 48 h. Alternatively, cells were cultured in the presence of rIL-7 (10 ng/ml; generously provided by Cytheris). When indicated, cycloheximide was added to cell cultures at a concentration of 5 μg/ml (Sigma-Aldrich). B cells were stimulated using IgM and anti-IgM. 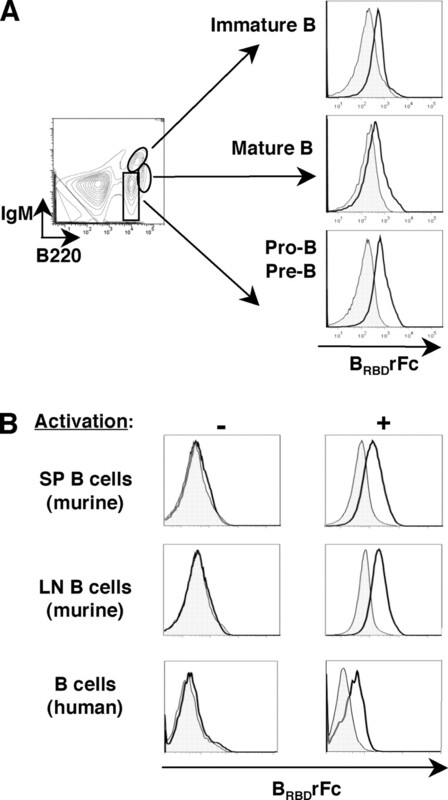 For analyses of murine B lymphocytes, cells were isolated from LN, spleen, and BM. For activation analyses, LN and spleen cells were resuspended at a concentration of 2.5 × 106 cells/ml in RPMI 1640 supplemented with 10% FCS and 10 μM 2-ME and activated with LPS at a concentration of 20 μg/ml. Thymocytes were isolated from thymi removed during corrective cardiac surgery of infants in accordance with local ethics board regulations. Single-cell thymocyte suspensions were generated by physical disruption of tissue and filtration through 70-μm nylon screens. Thymocytes were then cultured in RPMI 1640 supplemented with 10% FCS in the presence or absence of IL-7 (10 ng/ml). Before binding assays, adherent cells were detached with PBS containing 1 mM EDTA. Approximately, 3–5 × 105 cells were centrifuged for 3–5 min at 600 × g. Cells were resuspended in a 500-μl solution of either BRBDrFc, BRBDeGFP, HRBDrFc, or control supernatants as indicated. Labeling was performed at 37°C for 30 min. After two washes in PBA buffer (PBS containing 2% FBS and 0.01% sodium azide), cells labeled with a rFc-linked fusion protein were incubated with a FITC-conjugated sheep anti-rFc Ab (1/500 dilution in PBA buffer; Sigma-Aldrich) for 20 min on ice. Cells were washed twice with PBA buffer and then analyzed on a FACScan, FACSCalibur, or FACSCanto (BD Biosciences). To detect expression of CD19, CD4, CD8, CD25, and CD69 (Immunotech) on human cells and IgM, CD19, CD43, CD25, and c-Kit (BD Biosciences) on murine cells, samples were incubated for 20 min on ice with the appropriate fluorochrome-conjugated mAbs or isotype control mAbs. In all cases, cells were immediately analyzed on a FACSCalibur or FACScan (BD Biosciences) and data analysis was performed using CellQuest (BD Biosciences) or FlowJo (Tree Star) softwares. One day prior to transfection, 293 T cells (5 × 105) were plated in 6-well plates. Transfections of target cells with BRBDrFc and full-length BLV Env expression vectors (interference assay) or with the Glut1 expression vector (receptor expression) were performed using the calcium phosphate precipitation method. Cells were washed with DMEM 16 h later and assayed for RBD binding by flow cytometry after an additional 24 h.
Based on the amino acid homology between HTLV and BLV Env, a putative BLV RBD encoding the amino-terminal 182 aa of the SU was tagged with rabbit Ig Fc sequences at the C-terminal end (BRBDrFc). A SU N-terminal BLV Env subdomain encompassing the PRR, encoding 212 residues, was also constructed as a fusion protein with rFc or eGFP coding sequences (BRBDeGFP) (Fig. 1⇑). The various constructs were transfected in 293T cells and the recombinant fusion proteins were secreted as assessed by immunoblotting with Abs directed against the C-terminal tags (data not shown). To determine whether the truncated 212-aa and/or 182-aa BLV Env SU subdomains harbor BLV receptor-binding determinants, an Env-specific binding interference assay was performed. In this assay, 293T cells were transfected with the expression vector encoding BRBDrFc, without the PRR domain. Following transfection, binding of the soluble eGFP-tagged BRBD, harboring the PRR (residues 183–212), was monitored. Notably, BRBDeGFP binding was significantly inhibited in BRBDrFc-transfected cells and this effect was specific as binding of a heterologous-related SU domain, the HTLV Env SU ligand (HRBDeGFP), was not inhibited by transfection of the BRBDrFc-encoding plasmid (mean fluorescence intensity (MFI) of 14 vs 17 following transfection; Fig. 2⇓A, top panel). Similar interference results were also obtained after transfecting the entire BLV Env, with decreased BRBDeGFP binding (MFIs diminishing from 95 to 27) under conditions where HRBDeGFP binding was not affected (MFIs of 13 and 12, respectively; Fig. 2⇓A, bottom panel). Thus, BLV Env interfered with BRBDeGFP binding to levels that were equivalent to that of the BRBD subdomain. The ensemble of these data demonstrates that the 182-aa BLV Env SU subdomain, independent of the downstream PRR, is sufficient for specific cell surface binding to the BLV receptor. BLV-truncated RBD bind to the BLV receptor, a molecule distinct from Glut1. A, The specificity of BRBD receptor binding was validated by an envelope interference assay wherein 293T cells were transiently transfected with a control plasmid, the BRBDrFc expression plasmid (top panels) or the entire BLV Env (bottom panels) and assessed 48 h later for binding to BRBDeGFP and HRBDeGFP. Representative histograms showing staining of control-transfected (solid black line), BRBDrFc-transfected, and BLV Env-transfected (dashed line) 293T cells are presented. Nonspecific background staining is depicted as a filled histogram. The MFI of BRBDeGFP staining following BRBDrFc and BLV Env transfection changed from 30 to 15 and 95 to 27, respectively, while the MFI of HRBDeGFP staining changed from 14 to 17 and 13 to 12, respectively. B, 293T cells were transiently transfected with a control plasmid or a Glut1 expression vector. Thirty-six hours after transfection, cells were stained with either a rFc-tagged HTLV-2 RBD (HRBDrFc) that binds Glut1 (19 ,28 ,31 ,60 ) (upper panels) or the rFc-tagged BLV RBD (BRBDrFc, lower panels), followed by incubation with a secondary FITC-conjugated sheep anti-rabbit Ab. Filled histograms depict control binding. C, Binding of HRBDrFc and BRBDrFc was monitored on human red cells as described above. Staining profiles are presented in comparison to background binding (filled histogram). Data are representative of results obtained in three independent experiments. As indicated in the introduction, the identified gammaretrovirus receptors are all multimembrane spanning proteins. The homology and similar organization of the HTLV and BLV envelopes and their similar cell-type and species distribution made it important to test whether Glut1, the recently identified HTLV receptor, is recognized by the BLV envelope. As expected, transfection of 293T cells with a Glut1 expression vector resulted in a significantly increased level of binding to its HTLV Env SU ligand (HRBDrFc) (28, 31). Indeed, the MFI of HRBDrFc binding was ∼10-fold higher in the Glut1-transfected population as compared with the untransfected cells (Fig. 2⇑B). Significantly though, binding to the BRBDrFc ligand was unchanged following Glut1 transfection (Fig. 2⇑B), indicating that the BLV envelope does not interact with ectopically expressed Glut1. Furthermore, the ability of BLV Env to bind to Glut1 on human RBC was studied. Notably, RBC express the highest known levels of Glut1 with 300,000 copies/cell (35) and we have recently found that this expression increases significantly during erythropoiesis, resulting in a preferential transport of the oxidized form of vitamin C (36). As expected (29), the binding of HRBDrFc to human RBC was significant, reaching 2 log higher levels than background staining. In marked contrast, BRBDrFc staining of erythrocytes was not detectable (Fig. 2⇑C). Altogether, these data show that the BLV RBD does not interact with either endogenous or ectopic Glut1. The BRBDrFc fusion protein was used to assess cell surface expression of the BLV-binding receptor on distinct cell types of different species. As shown in Fig. 3⇓A, binding was detected on cells of all mammalian species we tested, including human, simian, porcine, dog, hamster, mink, and mouse cells. The cell types tested were diverse and included B and T lymphocyte, osteosarcoma, fibroblast, kidney, and lung cell lines. Although there was some variability in the level of BRBDrFc binding, the flow cytometry results demonstrate an apparent ubiquitous expression (Fig. 3⇓A), similar to that described for the related HTLV receptor (24, 37, 38). The BLV Env- binding receptor is expressed on diverse cell lines of different species and is down-regulated upon BLV infection. A, BRBDrFc was used to assess the cell surface expression of the BLV- binding receptor on transformed cell lines derived from the following species; human (293T, TE671, HeLa, JY, and Jurkat), simian (COS-7), porcine (PK15), dog (D17), hamster (A23), mink (CCL64), and mouse (Dunni and NIH3T3). Expression was also monitored on the Sf9 insect cell line. Cells were incubated with the BRBDrFc for 30 min at 37°C, followed by incubation with a FITC-conjugated anti-rabbit Fc Ab at 4°C. Binding was monitored by flow cytometry. Filled histograms depict background binding in the presence of the secondary FITC-conjugated anti-rabbit Ab alone while specific binding is shown as a solid line. Data are representative of results obtained in at least two independent experiments. B, BRBDrFc binding was assessed on bovine (TEK, KNS-R, and BL3) and ovine (PO) cell lines (top panels) as well as on the BLV-infected PO cell line and the fetal lamb kidney cell line (FLK-BLV) (bottom panels). We further investigated BLV-binding receptor expression on cell lines from species wherein BLV infection can result in B cell leukemia/lymphoma, including cows, sheep, and goats. Indeed, BRBDrFc binding was readily detected on bovine (TEK, KNS-R, BL3) and ovine (PO) cell lines (Fig. 3⇑B). Since it has been previously shown that these cell lines cannot be superinfected by the virus (39), it was of interest to assess BLV-binding receptor expression on these cells. As shown in Fig. 3⇑B, BRBDrFc binding to these cells was significantly lower than that detected on their noninfected counterparts. These data strongly suggest that one mechanism negatively regulating BLV superinfection is related to receptor down-regulation and/or competition for binding site occupancy. Finally, there was no detectable BRBDrFc binding to the Sf9 insect cell line, demonstrating that the receptor is not expressed or not functional on invertebrate cells. Because there were previously no available tools to evaluate the expression of the BLV receptor, its in vivo expression profile on different target cells was not determined before this study. The data presented in Fig. 3⇑ indicate a ubiquitous expression on cell lines, but expression on primary cell targets was not known. Given the B lymphotropic nature of the virus, we first assessed BLV-binding receptor expression on B-lineage cells. To determine whether there is a differential expression on B lymphocytes during differentiation, we analyzed murine BM cells because this compartment contains pro-B, pre-B, and immature as well as mature B cells. The various B cell subsets within the B220+ population can be distinguished on the basis of several markers, including CD43 and IgM. Indeed, costaining with multiple sets of Abs along with BRBDrFc demonstrated significantly higher levels of BLV-binding receptor on the less differentiated pro-B and pre-B subsets as compared with immature and mature B cells (Fig. 4⇓A and data not shown). Both pro- and pre-B cells, distinguished by CD25 and c-Kit expression, expressed the BLV-binding receptor (data not shown). The BLV-binding receptor is expressed on differentiating B cells and is induced on mature B cell following receptor activation. 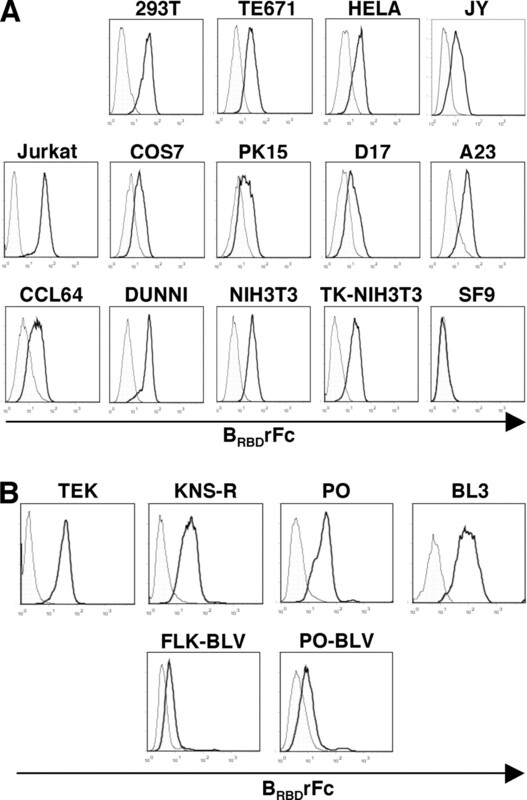 A, Expression of the BLV-binding receptor on differentiating B cells was monitored in mouse BM. Pro-/pre-B cells, immature B cells, and mature B cells were distinguished on the basis of IgM and B220 expression as shown and BRBDrFc binding in the three subsets is shown. B, BRBDrFc binding was assessed in freshly isolated (−) B220+ spleen and LN cells isolated from C57BL/6 mice as well as 48 h after LPS (20 μg/ml) stimulation (+). Human CD19+ lymphocytes were purified by positive selection and BRBDrFc binding was assessed before (−) and after (+) 3 days of BCR stimulation with an anti-IgM mAb (20 μg/ml). The ensemble of the experiments presented above demonstrated that BLV receptor expression is modulated during B cell differentiation in the BM, with the highest levels present on undifferentiated B lymphocytes. Indeed, we were unable to detect BLV receptor expression in mature murine B lymphocytes isolated from spleen or LN and similarly could not detect the receptor in human B lymphocytes isolated from peripheral blood. Notably though, these mature lymphocytes are largely quiescent and all previously identified gammaretrovirus receptors for which a function has been assigned have been found to be transporters of various nutrients and metabolites. We therefore hypothesized that expression of the BLV Env-binding receptor would be sensitive to the metabolic state of the cell. To test this hypothesis, we activated these cells ex vivo via their Ag receptor and then assessed receptor levels. Significantly, BLV Env-binding receptor levels were highly up-regulated in all of these mature B cell populations following receptor engagement (Fig. 4⇑B). Like B cells, the vast majority of circulating T lymphocytes are quiescent and are considered to have a very low metabolic activity, with very low glucose uptake (31). As such, it was not surprising to note that as in B cells, the BLV Env-binding receptor was not detected on quiescent human T lymphocytes. Notably though, activation of T cells via their Ag receptor (TCR) engagement using anti-CD3/anti-CD28 mAbs resulted in an induction of BRBDrFc staining (Fig. 5⇓A). Surface up-regulation of the BLV Env-binding receptor was extremely rapid, within 4 h of TCR stimulation (Fig. 5⇓A), similar to that shown for the HTLV Env receptor (28). The kinetics of cell surface BLV- binding receptor induction were slower than that of the CD69 activation marker, which was already induced by 2 h after TCR engagement and more rapid than that of the CD25 IL-2Rα subunit, which was only detected following 6–8 h of receptor stimulation (Fig. 5⇓A). Note that the low level CD25 expression detected in freshly isolated cells is characteristic of regulatory T cells and does not represent an activated cell state. The BLV-binding receptor is an early marker of TCR stimulation and its expression requires protein synthesis. A, Human umbilical cord CD4+ T lymphocytes were purified by negative selection. Expression of CD69, CD25, and the BLV Env-binding receptor was assessed on freshly isolated cells (0 h) and after 2, 4, 6, 8, 16, and 24 h of TCR stimulation with immobilized anti-CD3 and anti-CD28 mAbs (solid line histograms). Expression of these markers at each time point was also evaluated in the presence of the protein synthesis inhibitor CHX (5 μg/ml; dashed histograms). Background fluorescence obtained with the secondary FITC-conjugated Ab alone is shown in each histogram (filled histograms). B, BLV Env-binding receptor expression was also assessed at extended time points after 3, 6, and 11 days of TCR stimulation as well as on T cells undergoing homeostatic proliferation induced by rIL-7 stimulation (10 ng/ml). Data are representative of results obtained in at least two independent experiments. Stimulation of quiescent T lymphocytes to enter into cycle and proliferate requires a 7- to 10-fold increase in protein synthesis (40). Indeed, translation is crucial for the propagation of TCR-induced signals since in its absence, activation is inhibited (41). To assess whether surface expression of the BLV-binding receptor required de novo protein synthesis, quiescent human T lymphocytes were stimulated with anti-CD3/anti-CD28 mAbs in the presence of the protein synthesis inhibitor, cycloheximide (CHX). 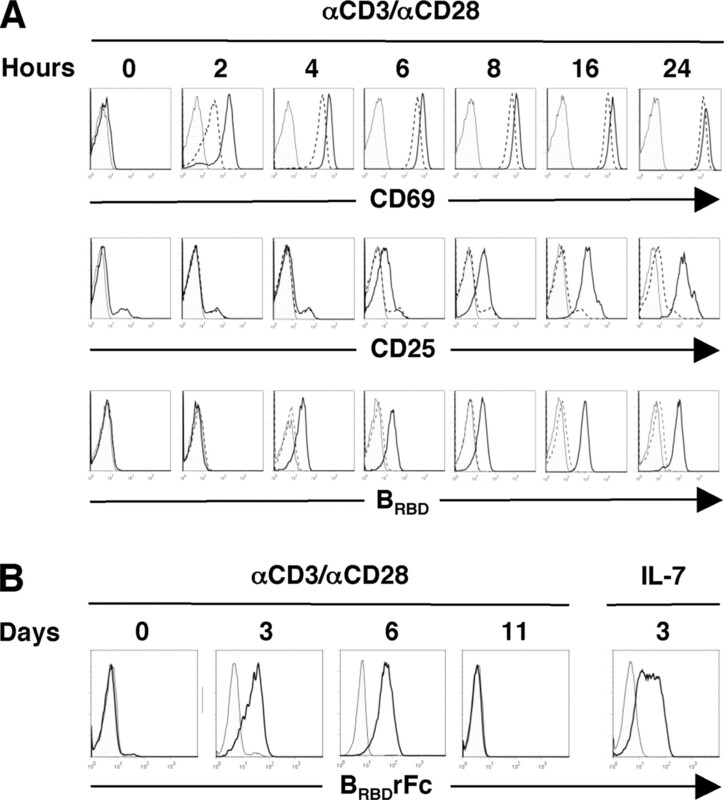 The presence of CHX during 24 h did not significantly modulate the maximal expression of the CD69 activation marker but markedly inhibited expression of the IL-2Rα subunit (Fig. 5⇑A, dashed histograms). Notably, induction of BRBDrFc staining was abrogated by CHX treatment at all time points assessed during the 24-h culture (Fig. 5⇑A, dashed histograms), demonstrating that the cell surface expression of the BLV-binding receptor requires de novo protein synthesis. Surface BLV-binding receptor levels remain elevated for 24–144 h after TCR stimulation but then diminished significantly as T cells returned to a resting state (Fig. 5⇑B). By day 11, T cells were quiescent and BRBDrFc staining was undetectable (Fig. 5⇑B). The BLV-binding receptor was also induced on umbilical cord T lymphocytes following their culture in the presence of the IL-7 cytokine (Fig. 4⇑A), a T cell survival factor that can stimulate proliferation of these T cells without inducing an extensive activation profile (42, 43). These data are very reminiscent of the expression profile of the HTLV receptor Glut1 (29, 44) and indicate that the BLV Env-binding receptor is a novel cell cycle entry/proliferation marker in both B and T lymphocytes. Given the high potential of the BLV receptor to be a nutrient/metabolite transporter, we hypothesized that it would have a role in the proliferation and differentiation of lymphocytes. As such, it was of interest to study the expression profile of the BLV-binding receptor during T cell development, specifically assessing thymocytes. In freshly isolated human thymocytes, the BLV-binding receptor was detected on ∼10–20% of cells, representing low percentages of immature CD4-CD8− (double negative (DN)), developing CD4+CD8+ (double positive (DP)), and a subset of single-positive (SP) CD4+ cells (Fig. 6⇓). Upon stimulation of thymocytes with IL-7 (10 ng/ml), a subset of cells became blast like, as demonstrated by an increase in their forward and side scatters (Fig. 6⇓). Analysis of these IL-7-induced thymocyte blasts revealed that the overwhelming majority, >90%, of these cells expressed the BLV-binding receptor as monitored by BRBDrFc staining (Fig. 6⇓). In marked contrast, the IL-7 nonresponsive DP thymocytes, remained small with low forward and side scatters and <5% expressed the BLV-binding receptor (Fig. 6⇓). The ensemble of these data reveals the BLV-binding receptor to be a remarkably specific marker of IL-7-responsiveness in developing thymocytes. IL-7-responsive human thymocytes express high BLV Env-binding receptor levels. Expression of the BLV Env-binding receptor was assessed on human thymocytes immediately upon isolation or following a 5-day culture in the presence or absence of rIL-7 (10 g/ml) for 5 days. Following IL-7 stimulation, BLV Env-binding receptor expression was assessed on the non-blast and blast populations as determined by forward and side scatter profiles. The gates used for analyses of thymocyte subsets are shown. The distribution of DN, CD4+CD8+ DP, CD4+ SP (SP4) and CD8+ SP (SP8) thymocyte populations within the indicated gates is presented. The relative expression of the BLV Env-binding receptor within each of these subsets was determined by incubation of thymocytes with BRBDrFc and secondary anti-rabbit IgG before staining with anti-CD4 and anti-CD8 mAbs. Histograms of BRBDrFc staining in the DN, DP, SP4, and SP8 populations are shown. Background staining obtained with the secondary FITC-conjugated Ab alone is depicted as filled histograms. In this study, we report the generation of BLV SU subdomain constructs encompassing all sequences required for a specific interaction with the yet unidentified cellular BLV receptor. This amino-terminal SU subdomain fusion protein, harboring aa 1–182 of BLV Env, is efficiently expressed and secreted from eukaryotic cell lines in a functional, soluble form. Notably, we find that binding to the BLV receptor did not require the presence of immediately downstream PRR sequences of BLV Env. This is of particular importance since, in the context of HTLV, retroviral PRR or downstream sequences may bind to cell surface components other than the primary receptor (45, 46), and sequences outside the RBD in some gammaretrovirus SU appear to modulate or block binding and infection (47, 48, 49). Nevertheless, in the context of the BLV envelope, an Env-specific binding interference assay demonstrated that the BLV RBD alone decreased BRBD binding to levels similar to that detected in the presence of the entire BLV Env. Therefore, the tagged BLV RBD polypeptide described here provides a unique specific marker of the BLV-binding receptor. Using this ligand, we found that the BLV RBD was able to bind target cells of all mammalian species tested, consistent with previous reports that BLV can be experimentally transmitted to a multitude of species including rabbits, rats, pigs, goats, and sheep as well as to cell lines in vitro (reviewed in Ref. 4). However, previous studies also reported a poor susceptibility of mouse cells to infection by BLV Env-pseudotyped virus (25, 39). Our results suggest that this partial resistance is not at the receptor-binding level, but may reflect a defect in postbinding events. Interestingly, in the case of HTLV Env-Glut1 interactions, it has been shown that membrane fusion and viral entry, which involve Env domains downstream of the RBD, also depend on domains in Glut1 located outside the primary Env binding site (4). Identification of the BLV receptor will help to resolve these issues. Moreover, we were able to assess the expression of the cellular BLV-binding receptor on primary target cells. Notably, BLV-binding receptor expression was detected on pro-B and pre-B cell subsets in murine BM but was present at lower levels on more differentiated B lymphocytes. We did not detect surface BLV-binding receptor expression on quiescent B or T lymphocytes but receptor levels were significantly induced following stimulation of the respective receptors. BLV-binding receptor expression was induced on both B and T lymphocytes under conditions of receptor as well as cytokine stimulation. This induction was independent of DNA synthesis because increased levels of BLV-binding receptor were detected as early as 4 h after receptor engagement while S phase entry requires at least 24 h of stimulation (28). Notably, BLV-binding receptor levels returned to undetectable levels at late time points following lymphocyte stimulation, consistent with their return to a quiescent state. We found that the surface expression of the BLV-binding receptor was dependent on de novo protein synthesis. This is likely due to the fact that resting B and T lymphocytes that make up the vast majority of the circulating lymphocyte pool are in a very low metabolic state. Although the persistent lymphocytosis and malignant lymphomas that can develop in BLV-infected animals are known to result from a deregulated B lymphocyte homeostasis, receptor levels on primary cells from these species have not yet been determined. We would predict that the pattern of receptor expression on bovine/ovine lymphocytes is similar to that which we observed here in murine and human lymphocytes, but it will be important to precisely evaluate this point. Moreover, receptor levels on bovine/ovine monocyte/macrophage and T-lineage cells should be evaluated since these cells have been shown to be infectable even if their role in pathogenesis is not known (1, 10, 11, 12, 13, 14). Elucidating the characteristics of receptor expression is crucial for furthering our understanding of BLV pathogenesis. The characteristics of BLV expression on lymphocyte subsets are evocative of that previously reported for the HTLV receptor (28, 44). Indeed, even before this receptor was identified as the Glut1 glucose transporter, it had been determined that Glut1 expression is closely linked to the metabolic state of the lymphocyte (50, 51, 52, 53). Significantly though, and as expected from previous studies of envelope interference, the BLV RBD did not interact with either ectopic or endogenous Glut1. Moreover, in contrast with the HTLV Env that binds extensively to human erythrocytes due to the extremely high levels of Glut1 on these cells, the BLV RBD did not interact with RBC. Thus, the cellular BLV-binding receptor is representative of a new metabolic marker that characterizes an activated lymphocyte. In addition to Glut1, the nutrient receptors that have been found to be crucial for lymphocyte development and proliferation include the CD71 transferrin receptor which mediates iron uptake (54, 55, 56) and CD98 (42F), a subunit of L-amino acid transporters (57, 58, 59). The identities of other nutrient receptors belonging to this group will undoubtedly be elucidated in the next few years and the BLV receptor promises to join this expanding list. We recently determined that Glut1 expression in the human thymus characterizes a subset of thymocytes with high metabolic activity, as determined by their large size, cell cycle entry, and high glucose uptake (60). It appears that Glut1 expression is enhanced on proliferating intermediate SP thymocytes and immature DP thymocytes that have recently undergone productive TCRβ gene rearrangements (60). In a situation analogous to that of Glut1, we determined that the BLV-binding receptor is expressed on only a minority of freshly isolated human thymocytes (10–20%), largely within the most immature DP thymocyte subset. IL-7, a cytokine that is crucial for thymocyte differentiation and proliferation, has previously been shown to induce responses in immature DN and mature SP cells, but not DP cells (61, 62, 63). In agreement with these data, we find that those IL-7-responsive human thymocytes, monitored as a function of their size and blast formation, are in vast majority SP and DN cells, excluding the DP population. It is therefore notable that >90% of these IL-7-responsive thymocytes express the BLV-binding receptor as compared with <5% of the nonresponsive population. Thus, IL-7 responsiveness thymocytes are specifically characterized by their expression of the cellular BLV-binding receptor. All identified gammaretrovirus receptors are multimembrane-spanning protein members whose function, when identified, has consistently been that of a facilitative nutrient or metabolite transporter. As such, this is highly likely to be a defining characteristic of the cellular BLV receptor. Importantly, the ensemble of the results reported here demonstrates that the BLV-binding receptor is a novel marker of B and T lymphocyte activation, closely linked to the metabolic state of the cell. Our generation of a BLV SU ligand reagent that binds to target cells from multiple species has significant potential; it can be used to assess the metabolic state of lymphocytes from a wide range of mammals, an especially important feature in species where Abs to lymphocyte activation markers have not been produced. Moreover, our data now provide important clues as to the nature of the BLV-binding receptor and the mechanisms via which this virus can be transmitted to an uninfected lymphocyte. The data presented here lay the groundwork for studies aimed at furthering our understanding of the natural as well as experimental transmission of BLV infection and elucidating the characteristics of the lymphocyte subsets that can potentially be infected in vivo. We thank R. Mamoun for the gift of BLV plasmids, Roland Riebe (CCLV), Jean Claude Twizere and Luc Willems (FSAGX) for the gift of cell lines. We are extremely grateful to P. Merida and S. Mennechet for expert assistance. L. Swainson, H. Abe, and J. Touhami generously provided support and we thank all members of our laboratory for insightful discussions. ↵1 This work was supported by grants from the Association Française Contre les Myopathies (to J.L.B., M.S., and N.T. ), Association pour la Recherche sur le Cancer, and the Agence Nationale de Recherches sur le SIDA (to M.S. and N.T. ), the European Community (Contract LSHC-CT-2005-018914 “ATTACK,” to N.T. ), and the Fondation de France (to M.S.). M.L. was supported by a grant from the Association Française Contre les Myopathies. J.L.B., N.T., and M.S. are supported by Institut National de la Santé et de la Recherche Médicale and S.K. by Centre National de la Recherche Scientifique. ↵2 M.L. and S.K. contributed equally to this work. ↵4 Abbreviations used in this paper: BLV, bovine leukemia virus; HTLV, human T cell leukemia virus; SU, surface unit; RBD, receptor-binding domain; PRR, proline-rich region; rFC, rabbit Ig Fc; eGFP, enhanced GFP; LN, lymph node; MFI, mean fluorescence intensity; BM, bone marrow; SP, single positive; CHX, cycloheximide; DN, double negative; DP, double positive; Env, envelope glycoprotein. Schwartz, I., A. Bensaid, B. Polack, B. Perrin, M. Berthelemy, D. Levy. 1994. In vivo leukocyte tropism of bovine leukemia virus in sheep and cattle. J. Virol. 68: 4589-4596. Wu, D., K. Takahashi, K. Murakami, K. Tani, A. Koguchi, M. Asahina, M. Goryo, Y. Aida, K. Okada. 1996. B-1a, B-1b and conventional B cell lymphoma from enzootic bovine leukosis. Vet. Immunol. Immunopathol. 55: 63-72. Saini, S. S., B. Allore, R. M. Jacobs, A. Kaushik. 1999. Exceptionally long CDR3H region with multiple cysteine residues in functional bovine IgM antibodies. Eur. J. Immunol. 29: 2420-2426. Burny, A., Y. Cleuter, R. Kettmann, M. Mammerickx, G. Marbaix, D. Portetelle, A. van den Broeke, L. Willems, R. Thomas. 1988. Bovine leukaemia: facts and hypotheses derived from the study of an infectious cancer. Vet. Microbiol. 17: 197-218. Schwartz-Cornil, I., N. Chevallier, C. Belloc, D. Le Rhun, V. Laine, M. Berthelemy, A. Mateo, D. Levy. 1997. Bovine leukaemia virus-induced lymphocytosis in sheep is associated with reduction of spontaneous B cell apoptosis. J. Gen. Virol. 78: 153-162. Dequiedt, F., G. H. Cantor, V. T. Hamilton, S. M. Pritchard, W. C. Davis, P. Kerkhofs, A. Burny, R. Kettmann, L. Willems. 1999. Bovine leukemia virus-induced persistent lymphocytosis in cattle does not correlate with increased ex vivo survival of B lymphocytes. J. Virol. 73: 1127-1137. Debacq, C., N. Gillet, B. Asquith, M. T. Sanchez-Alcaraz, A. Florins, M. Boxus, I. Schwartz-Cornil, M. Bonneau, G. Jean, P. Kerkhofs, et al 2006. Peripheral blood B-cell death compensates for excessive proliferation in lymphoid tissues and maintains homeostasis in bovine leukemia virus-infected sheep. J. Virol. 80: 9710-9719. Debacq, C., B. Asquith, P. Kerkhofs, D. Portetelle, A. Burny, R. Kettmann, L. Willems. 2002. Increased cell proliferation, but not reduced cell death, induces lymphocytosis in bovine leukemia virus-infected sheep. Proc. Natl. Acad. Sci. USA 99: 10048-10053. Rovnak, J., J. W. Casey, A. L. Boyd, M. A. Gonda, G. L. Cockerell. 1991. Isolation of bovine leukemia virus infected endothelial cells from cattle with persistent lymphocytosis. Lab. Invest. 65: 192-202. Heeney, J. L., P. J. Valli, R. M. Jacobs, V. E. Valli. 1992. Evidence for bovine leukemia virus infection of peripheral blood monocytes and limited antigen expression in bovine lymphoid tissue. Lab. Invest. 66: 608-617. Buehring, G. C., P. M. Kramme, R. D. Schultz. 1994. Evidence for bovine leukemia virus in mammary epithelial cells of infected cows. Lab. Invest. 71: 359-365. Domenech, A., J. Goyache, L. Llames, M. Jesus Paya, G. Suarez, E. Gomez-Lucia. 2000. In vitro infection of cells of the monocytic/macrophage lineage with bovine leukaemia virus. J. Gen. Virol. 81: 109-118. Wu, D., K. Murakami, A. Morooka, H. Jin, Y. Inoshima, H. Sentsui. 2003. In vivo transcription of bovine leukemia virus and bovine immunodeficiency-like virus. Virus Res. 97: 81-87. Mirsky, M. L., C. A. Olmstead, Y. Da, H. A. Lewin. 1996. The prevalence of proviral bovine leukemia virus in peripheral blood mononuclear cells at two subclinical stages of infection. J. Virol. 70: 2178-2183. Sagata, N., Y. Ikawa. 1984. BLV and HTLV-I: their unique genomic structures and evolutionary relationship. Princess Takamatsu Symp. 15: 229-240. Kim, F. J., I. Seiliez, C. Denesvre, D. Lavillette, F. L. Cosset, M. Sitbon. 2000. Definition of an amino-terminal domain of the human T-cell leukemia virus type 1 envelope surface unit that extends the fusogenic range of an ecotropic murine leukemia virus. J. Biol. Chem. 275: 23417-23420. Johnston, E. R., L. M. Albritton, K. Radke. 2002. Envelope proteins containing single amino acid substitutions support a structural model of the receptor-binding domain of bovine leukemia virus surface protein. J. Virol. 76: 10861-10872. Fass, D., R. A. Davey, C. A. Hamson, P. S. Kim, J. M. Cunningham, J. M. Berger. 1997. Structure of a murine leukemia virus receptor-binding glycoprotein at 2.0 angstrom resolution. Science 277: 1662-1666. Callebaut, I., J. P. Mornon, A. Burny, D. Portetelle. 1994. The bovine leukemia virus (BLV) envelope glycoprotein gp51 as a general model for the design of a subunit vaccine against retroviral infection: mapping of functional sites through immunological and structural data. Leukemia 8: (Suppl. 1):S218-S221. Kobe, B., R. J. Center, B. E. Kemp, P. Poumbourios. 1999. Crystal structure of human T cell leukemia virus type 1 gp21 ectodomain crystallized as a maltose-binding protein chimera reveals structural evolution of retroviral transmembrane proteins. Proc. Natl. Acad. Sci. USA 96: 4319-4324. Johnston, E. R., K. Radke. 2000. The SU and TM envelope protein subunits of bovine leukemia virus are linked by disulfide bonds, both in cells and in virions. J. Virol. 74: 2930-2935. Manel, N., J. L. Battini, N. Taylor, M. Sitbon. 2005. HTLV-1 tropism and envelope receptor. Oncogene 24: 6016-6025. Ban, J., D. Portetelle, C. Altaner, B. Horion, D. Milan, V. Krchnak, A. Burny, R. Kettmann. 1993. Isolation and characterization of a 2.3-kilobase-pair cDNA fragment encoding the binding domain of the bovine leukemia virus cell receptor. J. Virol. 67: 1050-1057. Suzuki, T., Y. Matsubara, H. Kitani, H. Ikeda. 2003. Evaluation of the δ subunit of bovine adaptor protein complex 3 as a receptor for bovine leukaemia virus. J. Gen. Virol. 84: 1309-1316. Sommerfelt, M. A.. 1999. Retrovirus receptors. J. Gen. Virol. 80: 3049-3064. Manel, N., S. Kinet, J. L. Battini, F. J. Kim, N. Taylor, M. Sitbon. 2003. The HTLV receptor is an early T-cell activation marker whose expression requires de novo protein synthesis. Blood 101: 1913-1918. Manel, N., F. J. Kim, S. Kinet, N. Taylor, M. Sitbon, J. L. Battini. 2003. 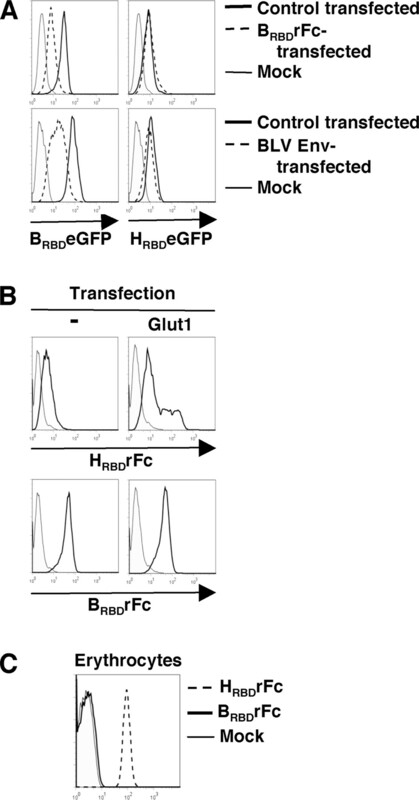 The ubiquitous glucose transporter GLUT-1 is a receptor for HTLV. Cell 115: 449-459. Manel, N., J. L. Battini, M. Sitbon. 2005. Human T cell leukemia virus envelope binding and virus entry are mediated by distinct domains of the glucose transporter GLUT1. J. Biol. Chem. 280: 29025-29029. Tailor, C. S., D. Lavillette, M. Marin, D. Kabat. 2003. Cell surface receptors for gammaretroviruses. Curr. Top. Microbiol. Immunol. 281: 29-106. Sommerfelt, M. A., R. A. Weiss. 1990. Receptor interference groups of 20 retroviruses plating on human cells. Virology 176: 58-69. Battini, J. L., J. E. Rasko, A. D. Miller. 1999. A human cell-surface receptor for xenotropic and polytropic murine leukemia viruses: possible role in G protein-coupled signal transduction. Proc. Natl. Acad. Sci. USA 96: 1385-1390. Mueckler, M.. 1994. Facilitative glucose transporters. Eur. J. Biochem. 219: 713-725. Montel-Hagen, A., S. Kinet, N. Manel, C. Mongellaz, R. Prohaska, J. L. Battini, J. Delaunay, M. Sitbon, N. Taylor. 2008. Erythrocyte Glut1 triggers dehydroascorbic acid uptake in mammals unable to synthesize vitamin C. Cell 132: 1039-1048. Jassal, S. R., R. G. Pohler, D. W. Brighty. 2001. Human T-cell leukemia virus type 1 receptor expression among syncytium-resistant cell lines revealed by a novel surface glycoprotein-immunoadhesin. J. Virol. 75: 8317-8328. Sutton, R. E., D. R. Littman. 1996. Broad host range of human T-cell leukemia virus type 1 demonstrated with an improved pseudotyping system. J. Virol. 70: 7322-7326. Derse, D., L. Martarano. 1990. Construction of a recombinant bovine leukemia virus vector for analysis of virus infectivity. J. Virol. 64: 401-405. Ahern, T., J. Sampson, J. E. Kay. 1974. Initiation of protein synthesis during lymphocyte stimulation. Nature 248: 519-521. Varesio, L., H. T. Holden. 1980. Mechanisms of lymphocyte activation: linkage between early protein synthesis and late lymphocyte proliferation. J. Immunol. 124: 2288-2294. Hassan, J., D. J. Reen. 1998. IL-7 promotes the survival and maturation but not differentiation of human post-thymic CD4+ T cells. Eur. J. Immunol. 28: 3057-3065. Nath, M. D., F. W. Ruscetti, C. Petrow-Sadowski, K. S. Jones. 2003. Regulation of the cell-surface expression of an HTLV-I binding protein in human T cells during immune activation. Blood 101: 3085-3092. Ghez, D., Y. Lepelletier, S. Lambert, J. M. Fourneau, V. Blot, S. Janvier, B. Arnulf, P. M. van Endert, N. Heveker, C. Pique, O. Hermine. 2006. Neuropilin-1 is involved in human T-cell lymphotropic virus type 1 entry. J. Virol. 80: 6844-6854. Jones, K. S., K. Fugo, C. Petrow-Sadowski, Y. Huang, D. C. Bertolette, I. Lisinski, S. W. Cushman, S. Jacobson, F. W. Ruscetti. 2006. Human T-cell leukemia virus type 1 (HTLV-1) and HTLV-2 use different receptor complexes to enter T cells. J. Virol. 80: 8291-8302. Boomer, S., M. Eiden, C. C. Burns, J. Overbaugh. 1997. Three distinct envelope domains, variably present in subgroup B feline leukemia virus recombinants, mediate Pit1 and Pit2 receptor recognition. J. Virol. 71: 8116-8123. Faix, P. H., S. A. Feldman, J. Overbaugh, M. V. Eiden. 2002. Host range and receptor binding properties of vectors bearing feline leukemia virus subgroup B envelopes can be modulated by envelope sequences outside of the receptor binding domain. J. Virol. 76: 12369-12375. Gemeniano, M., O. Mpanju, D. R. Salomon, M. V. Eiden, C. A. Wilson. 2006. The infectivity and host range of the ecotropic porcine endogenous retrovirus, PERV-C, is modulated by residues in the C-terminal region of its surface envelope protein. Virology 346: 108-117. Chakrabarti, R., C. Y. Jung, T. P. Lee, H. Liu, B. K. Mookerjee. 1994. Changes in glucose transport and transporter isoforms during the activation of human peripheral blood lymphocytes by phytohemagglutinin. J. Immunol. 152: 2660-2668. Rathmell, J. C., R. L. Elstrom, R. M. Cinalli, C. B. Thompson. 2003. Activated Akt promotes increased resting T cell size, CD28-independent T cell growth, and development of autoimmunity and lymphoma. Eur. J. Immunol. 33: 2223-2232. Rathmell, J. C., M. G. Vander Heiden, M. H. Harris, K. A. Frauwirth, C. B. Thompson. 2000. In the absence of extrinsic signals, nutrient utilization by lymphocytes is insufficient to maintain either cell size or viability. Mol. Cell 6: 683-692. Trowbridge, I. S., D. A. Shackelford. 1986. Structure and function of transferrin receptors and their relationship to cell growth. Biochem. Soc. Symp. 51: 117-129. Brekelmans, P., P. van Soest, J. Voerman, P. P. Platenburg, P. J. Leenen, W. van Ewijk. 1994. Transferrin receptor expression as a marker of immature cycling thymocytes in the mouse. Cell. Immunol. 159: 331-339. Macedo, M. F., M. de Sousa, R. M. Ned, C. Mascarenhas, N. C. Andrews, M. Correia-Neves. 2004. Transferrin is required for early T-cell differentiation. Immunology 112: 543-549. Lindsten, T., C. H. June, C. B. Thompson, J. M. Leiden. 1988. Regulation of 4F2 heavy-chain gene expression during normal human T-cell activation can be mediated by multiple distinct molecular mechanisms. Mol. Cell. Biol. 8: 3820-3826. Gottesdiener, K. M., B. A. Karpinski, T. Lindsten, J. L. Strominger, N. H. Jones, C. B. Thompson, J. M. Leiden. 1988. Isolation and structural characterization of the human 4F2 heavy-chain gene, an inducible gene involved in T-lymphocyte activation. Mol. Cell. Biol. 8: 3809-3819. Kelly, A. P., D. K. Finlay, H. J. Hinton, R. G. Clarke, E. Fiorini, F. Radtke, D. A. Cantrell. 2007. Notch-induced T cell development requires phosphoinositide-dependent kinase 1. EMBO J. 26: 3441-3450. Swainson, L., S. Kinet, N. Manel, J. L. Battini, M. Sitbon, N. Taylor. 2005. Glucose transporter 1 expression identifies a population of cycling CD4+ CD8+ human thymocytes with high CXCR4-induced chemotaxis. Proc. Natl. Acad. Sci. USA 102: 12867-12872. Van De Wiele, C. J., J. H. Marino, B. W. Murray, S. S. Vo, M. E. Whetsell, T. K. Teague. 2004. Thymocytes between the β-selection and positive selection checkpoints are nonresponsive to IL-7 as assessed by STAT-5 phosphorylation. J. Immunol. 172: 4235-4244. Munitic, I., J. A. Williams, Y. Yang, B. Dong, P. J. Lucas, N. El Kassar, R. E. Gress, J. D. Ashwell. 2004. Dynamic regulation of IL-7 receptor expression is required for normal thymopoiesis. Blood 104: 4165-4172. Yu, Q., B. Erman, J. H. Park, L. Feigenbaum, A. Singer. 2004. IL-7 receptor signals inhibit expression of transcription factors TCF-1, LEF-1, and RORγt: impact on thymocyte development. J. Exp. Med. 200: 797-803.